The M-200i being part of the V-Mixer family means it has award-winning sound quality, operation and expandability – all condensed into a compact body. It is a V-Mixer with 24 analog inputs, 12 analog outputs and stereo digital output (AES/EBU) all built-in to the main unit. It's ready to perform, out of the box. The M-200i is a part of the V-Mixer lineup which includes the M-480, and the M-300. To find out more about how each model compares see the V-Mixer Comparison Chart. 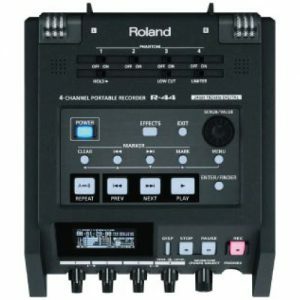 With the built-in REAC port, it is easily expanded to include remote I/O simply by adding a Roland Digital Snake head. Expand further with any other device from the REAC family including Personal Mixers and/or Multi-channel Recorder/Player technology. Inside it is equipped with a fully spec’d 32 channels plus Main LR, 8 AUX, 4 Matrix outputs, along with 8 DCA groups. 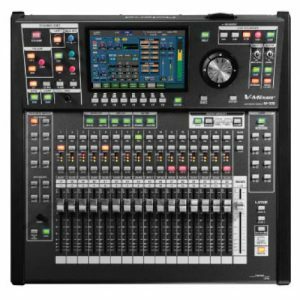 It is loaded with four multi-effect processors and four 31-band graphic EQ units which are requirements for any professional live sound production. Other popular functions including WAV recording/playback using USB memory, remote control via PC/Mac, and DAW recording. Add the powerful and comprehensive iPad app to control the M-300 V-Mixer. Available on the iTunes AppStore. The flexibility and mobility of comprehensive iPad control fused with the reliability and precision of a professional digital mixing console. Cutting edge hybrid surface that combines an iPad with a physical controller. The iPad functions as a large touch screen display. 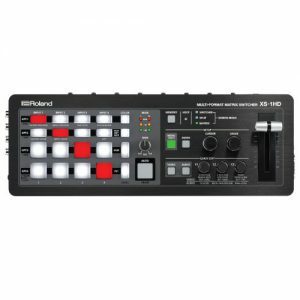 Use the iPad for intuitive control of effects and other graphical manipulation, while physically controlling the volume with the motorized faders. The advanced “Touch & Turn” surface provides a more convenient mixing environment than ever before by allowing you to touch a control on the iPad and control it with a physical knob. All functions required for high-end live audio production are included. Comfortable mixing capacity with 32ch inputs + Main/8AUX/4Matrix outputs. Despite its compact size, the M-200i ensures a comfortable 32ch input mix capacity. The output has the full specifications of Main(LR)/8AUX/4Matrix, which supports many mixing applications. 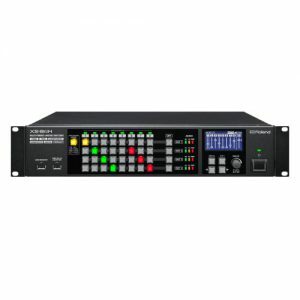 Any of the built-in 24 analog inputs, the 40×40 channels on the REAC port, the effect outputs, and USB memory recorder can be assigned to the 32 channels. Highly flexible performance regardless of your operational preferences. By incorporating the iPad, the M-200i can be operated in a variety of styles to fit any situation. Sound checks can be performed remotely from the stage or any location/seat in the room using the iPad. At the same time, all operations can still be performed at the console using the built-in display and dedicated knobs and buttons. All input channels are equipped with two dynamics processors and a 4-band parametric EQ. A gate/expander, compressor and 4-band parametric EQ are available on all 32 channels. The basics of any mix starts with good channel processing and the M-200i has it covered. The Main/8AUX/4Matrix output buses are all equipped with a compressor, 4-band parametric EQ, limiter, and delay. Internal or remote head amp circuitry is digitally controlled for full recall. The head amp control circuit is fully digitalized so at the touch of a button, all the parameters can be saved or recalled instantly. An externally connected Digital Snake is easily connected and remotely controlled perfectly from the M-200i surface. 24×12 Analog I/O that is easily expanded with REAC. 16 mic/line inputs, 8 line inputs, 2 main outputs, and 10 assignable outputs are all included in the compact body. Connect a Digital Snake to the REAC port to expand the number of inputs and outputs. 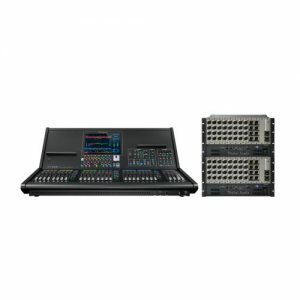 It is also equipped with stereo digital output (AES/EBU) for directly connecting digital devices, as well as two headphone outputs for multiple-operator monitoring. Discrete design of high-grade head amp circuit. Instantly save/recall all parameters. 16 inputs are equipped with a discretely designed high-grade microphone preamp circuit. 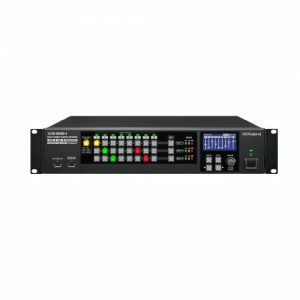 The full digital control specification allows for instant saving and recalling of all parameters such as input gain, padding, and phantom power. An externally connected Digital Snake is fully controlled remotely. Equipped with four versatile multi-effect processors. No need for outboard gear. Four multi-effect processors can be easily inserted into any input channel, AUX bus, matrix bus and final output bus. Effect types can be selected from fifteen kinds of processors including reverb and delay, as well as three kinds of Roland “Vintage Effects” which are praised by audio engineers throughout the world. Four 31-band graphic EQs – crucial for fine sound correction. Four 31-band graphic EQs are included which are indispensable for live venues. Used together with signal delay on the input channel and output bus, detailed sound adjustments can be easily performed with the M-200i. In a venue where more detailed sound correction is required, four more 31-band graphic EQs can be used by selecting the graphic EQ from the four multi-effects. Built-in USB memory recorder for Uncompressed WAV recording. Any two of the Main/8AUX/4Matrix outputs can be recorded as a 16-bit, uncompressed WAV file by inserting a USB memory stick in the back panel. WAV files stored in USB memory can be also be played from any input channel. In addition, the USB memory can be used for saving/loading configuration files on the M-200i. Comprehensive iPad control enables even better ways to mix a room. Not just a few functions but comprehensive control – new workflows and ways to mix a room. Remotely control all aspects of the mix from the iPad and enjoy the feeling of superior response and comfortable operation. One of the compelling features the M-200i brings is the comfort of a surface with faders, knobs and buttons so tightly integrated with fully featured iPad screens that go well beyond controlling just a limited set of features. A wireless connection is established by simply attaching the WNA1100-RL Wireless USB Adapter or a wireless LAN access point that in turn allows the user to remotely control the M-200i with the iPad from the stage or any location in the house. Operating the M-200i is not limited by its physical location. The DOCK CABLE for connecting the iPad is included. The DOCK CABLE connector for the iPad provides a reliable wired connection and stable operation which is not affected by fluctuations in electrical current. The DOCK CABLE connector also supplies power to the iPad. Use a Apple Lightning to 30-pin Adapter to connect with the new iPad and iPad mini. The M-200i can be controlled remotely from a PC (Windows/Mac) by using the M-200i RCS* dedicated software. You can operate the M-200i simultaneously from the iPad, a PC and the M-200i itself. *The M-200i RCS is a free download. Three types of wireless connections. Various methods of recording to fit any venue and application. With REAC, it is a simple setup to enable high quality live multi-channel recording with the M-200i. Connect a computer’s network port via a Cat5e/6 cable to the REAC port and record up to 40 channels directly to “Cakewalk SONAR Producer” DAW software. Edit and mix immediately after the recording. When the R-1000 48-track recorder/player is connected, a full playback and recording environment is enabled for virtual rehearsals, trainings and live capture. This way a fully integrated playback and recording system can be built without using a computer. 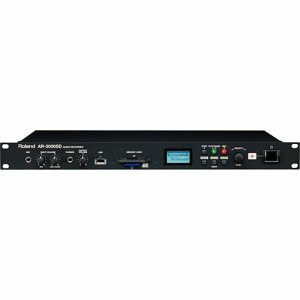 Use the S-MADI unit to interface into MADI-based recording or broadcast environments. The S-RDK REAC Driver Kit is required for recording to Cakewalk SONAR Producer. The Roland OCTA-CAPTURE, the FA-66, or the VS-700R is required for monitoring. The superior operability of the control surface enables all operations from the unit itself. The M-200i can perform all operations with the moving faders, buttons and konbs on the main body itself. The parameter levels, system settings, and level meters can be confirmed with the LCD screen located on the top right corner. If an unexpected problem occurs with the iPad, all operations can be performed with the M-200i exclusively. Remote control interface including MIDI and RS-232 connectors. Supports V-LINK to sync with video equipment. The back panel is equipped with MIDI connectors to transmit and receive data to and from external devices along with an RS-232C connector for integrated wall-panel and other types of remote control. 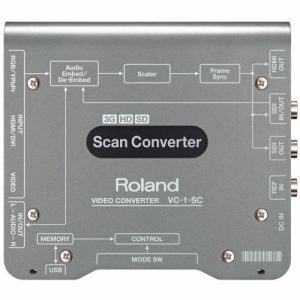 The MIDI connectors support V-LINK, which makes it possible to link to Roland video equipment. 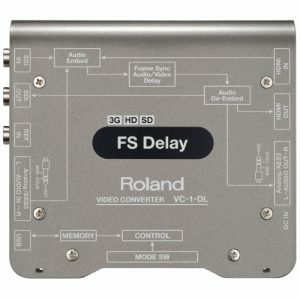 When a device such as the V-40HD Video Switcher is connected, video images can be synchronized with the volume control of any channel – a true audio-follows-video configuration. The backbone of the V-Mixing System is based on REAC – Roland’s Ethernet Audio Communication transmission protocol for low latency, high quality digital audio transfer. Products using REAC technology are installed today in many venues and have been used for high profile events worldwide. 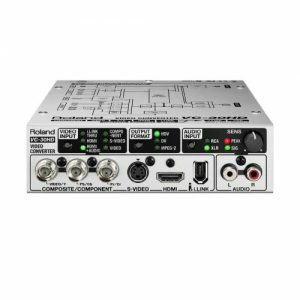 REAC’s 24-bit, 40×40 channel protocol delivers pristine digital audio via lightweight, inexpensive and easy to install cable (Cat5e/6). REAC technology is immune to externally induced signal quality degradation or hums and buzzes typically found in analog systems. You have more freedom in cable placement resulting in lower cost and better sounding. Learn more about the power and benefits of REAC. 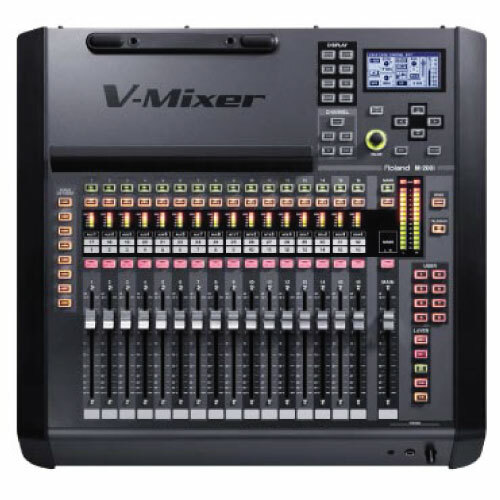 See Pre-Configured V-Mixing Systems ready to go here. See more Roland Professional A/V awards and nominations on our Awards Page. * Total Latency of audio signal from M-200i’s console inputs to M-200i’s outputs. * Total System Latency of audio signal from S-1608 inputs to outputs via M-200i’s REAC ports. Use USB Flash Memory sold by Roland. Other products are not guaranteed to work. * In the interest of product improvement, the specifications and/or appearance of this unit are subject to change without prior notice. * 1: When a REAC Splitter S-4000D or a switching hub is used in-line with REAC cables, the network latency will increase by the amount of processing delay introduced by the splitting device itself. The actual delay is dependant upon the specifications of the splitting device, though the maximum delay amount for a single splitting device should be no more than 200 microseconds.